I’m an award-winning author, credentialed teacher, blogger, and entrepreneur. I have over ten years experience teaching English to students with disabilities. I am the CEO of Building Voices and TCD Kids Foundation, and am a member of SCBWI and IBPA. 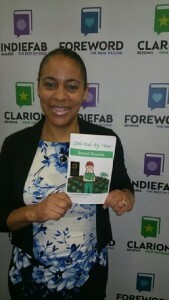 My first book, Broccoli Chronicles won the 2015 National Indie Excellence Award in Children’s Fiction and Honorable Mention in Foreword Reviews’ 2014 ‪INDIEFAB‬ Book of the Year Awards for Juvenile Fiction! My articles, “Try, Try Again” and “Feedback That’s Fulfilling” were both published in the IBPA Independent Magazine. I started writing back in middle school, but instead of children’s books, I wrote poetry. I loved the freedom to express myself and be creative. I started writing children’s books sometime around 2007 when I noticed the decline in graduation rates and the scarce number of children that read. I wanted to create a book series that not only motivated them to read more, but help them find their true potential in life. You would be amazed at the things we discover through reading, even for the younger generation. Kids are smart and they absorb information quickly. I notice this everyday in my daughter. She’s only 18 months and she loves books. I want to instill this in every child at every age. Thoughts and images come to me constantly throughout the day so I keep a piece of paper with me. Sometimes, it’s just a thought or phrase, but other times it’s an actual storyline, so I immediately write it down. I love writing in my office where it’s neat, clean, and free from clutter so that I’m not inundated with distractions. Usually, it’s really quiet in the room unless I need inspiration, so then I turn on some gospel music and just let it relax me. No, I don’t talk to them, but I try to live through them. It’s almost like jumping into their world and becoming a ten-year-old kid for a moment. Sometimes, I think back to when I was a child and try to remember some of the language that was used when interacting with other children. Being a children’s author requires a lot of talent and patience. It’s not easy putting on the mindset of a child. I had a really fun time writing Myrtle Beckle in Broccoli Chronicles. Her personality cracks me up! First of all, stay true to yourself, your vision, and your craft. Second, try to create characters that are unforgettable. There are certain characters that win you over right away and that’s what we need in order to sell books and get kids to fall in love with reading again. Last, spend time on details. Make sure that you proofread your work. Hire an editor and someone that formats books. Your image and repetition are on the line. Make sure that every book is polished. I originally wanted to go with a traditional publisher, but I was turned down for two reasons. One, I don’t think they were ready for the concept of broccoli curing cancer and second, I didn’t have an author platform just yet. My first novel, Broccoli Chronicles, is about a young girl who loves broccoli and wants to cure cancer with it. Her mom passed away so she doesn’t want other kids to experience the loss like she has. Well, it’s a very funny, inspiring, and well-written story, but I guess they didn’t see the vision for it. Plus at that time, I had no platform. I don’t think I had a website or blog. Maybe this would’ve made a difference or not. Well, after a few rejections, I decided to create my own publishing company and self-publish. So far, things are great. Broccoli Chronicles has been featured in magazines, newsletters, and blogs, plus it won two awards! Yay! I guess that was their loss and my gain! I think the self-publishing world is going to take over. It is more attainable and is becoming more popular everyday.